CIMA Plastics Group, an injection molding company provides complete outsourcing solutions for your innovative plastic products/components. Founded in 1976 CIMA's 30+ years of success can be attributed to our commitment to supplying quality injection molded products, on time at a competitive price. Our complete outsourcing solutions are developed and executed by our injection molding professionals and engineers who have over 50 years of expertise. Beginning with the design process, our engineers work with our customers to create a process optimized for manufacturing and assembly. This is followed by the mold design and construction which culminates with successful part production on our meticulously maintained 85-600 ton injection molding machines. 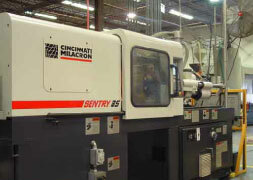 Our secondary equipment includes custom assembly and final packaging machinery. CIMA's solutions have proved exceptional versus some of the finest injection molding services in the world. CIMA gets it right... On time! Our unique strategy toward complete outsourcing solutions allows us to develop close working relationships/partnerships with all of our customers. Our goal is to develop these partnerships so our combined efforts achieve improvements in design and quality while reducing costs. CIMA is conveniently located on I-480 twenty minutes east of downtown Cleveland. Our facility offers excellent access to all modes of transportation to support our customers all across the country. We are centrally located at the hub of three major airports: Cleveland, Pittsburgh and Akron Regional.